Not many people realize the proud beer brewing tradition that once dominated Cincinnati. Over The Rhine not only received its name from its large German population, but those same immigrants brought along their taste for good beer. Before the neighborhood's decline, subsequent neglect and present resurgence, it was the densest neighborhood in all of Cincinnati and much of it's Romanesque architecture and former brewery's still remain today hidden behind industrial facades. 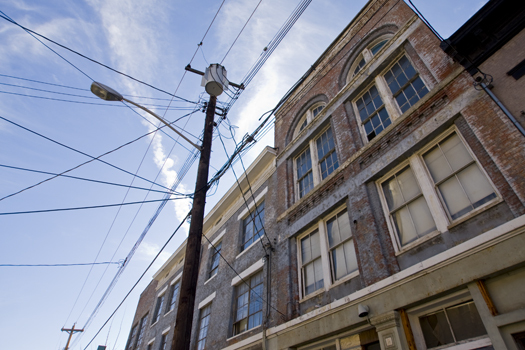 In an effort to raise awareness of this neighborhoods historic significance and redevelopment potential, the people of the OTR Brewery District Redevelopment Corp. hold a "Prohibition Resistance Tour" every year, allowing participants to get a rare, up close look at these former breweries. Steve Hampton was kind enough to let me come into the former Schmidt Brothers/Crown Brewery, the newest location on this years tour, and shoot some exclusive photos. During the opening of this year's Forgotten Cincinnati exhibit, I ran into my friend and Broomball teammate Brad Thomas, founder of CincyStreetcar.com. Brad isn't just an ardent streetcar supporter, but he's been volunteering his time lately to help get the Crown Brewery ready, a new stop on this years Prohibition Resistance Tour. Brad made a call to some friends and said to me "Hey I got a really cool place for you to check out, Steve said you could come by tomorrow. Just be there between 10 A.M. and 2 P.M." Only problem was Brad couldn't remember the exact address. So after some early Saturday morning internet research and some wrong turns, I found myself knocking on the steel doors of the former Crown Brewery on McMicken Ave. I wasn't sure if anyone was inside as I looked at the building, which looks more like an abandoned warehouse, with no outside clues to its past. Little did I know that I was literally standing right above one of the coolest pieces of Cincinnati history I've ever come across. 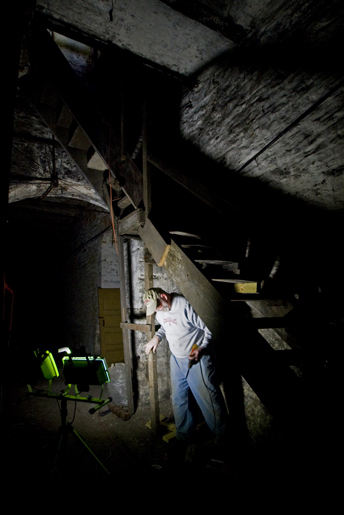 - Jim Buquo works on bracing a set of stairs inside the brewery in anticipation of the tour. As the steel garage door rolled up I met Jim Buquo, a volunteer who has been spending time during his weekends getting the brewery into shape for tours to go through. As Jim lead me through what seemed like just a normal industrial warehouse, he informed me of the history behind the Crown Brewery. The brewery, just one of many in the neighborhood, opened in 1891 and thrived until the United States government passed the 18th amendment which banned the sale, consumption, manufacturing and transportation of alcohol within the country. During this period known as "Prohibition," the Crown Brewery would attempt to sell non alcoholic "near beers" and root beer, but would cease operation around 1921. The industrial setting of the factory changed as Jim lead me down a set of wooden stairs into the stone basement of the building. 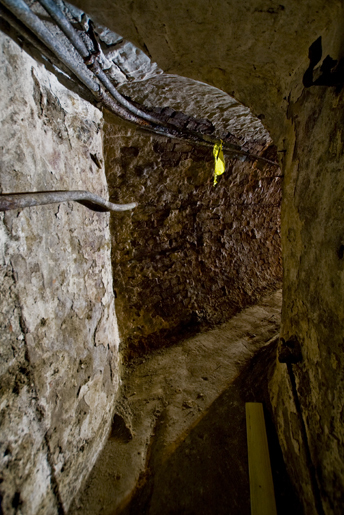 Flood lights guided our way into a set of wooden stairs which lead even deeper underground into the cellar. 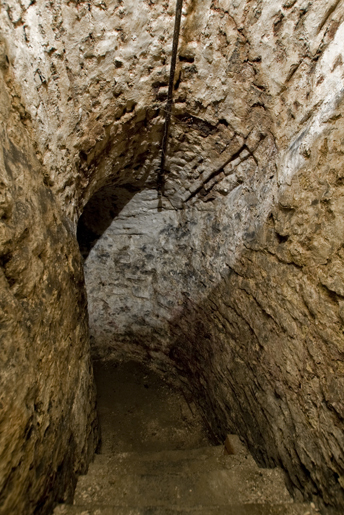 - Stone stairs leading to the brewery's Lagering room/cellar. Down here we were joined by Steve Hampton, the head honcho of the brewery district, the guy organizing all this hard work so that others can see these places. Steve and Jim explained that these lower rooms has been used as a lagering room, where lager beer would rest until it was ready to be served. 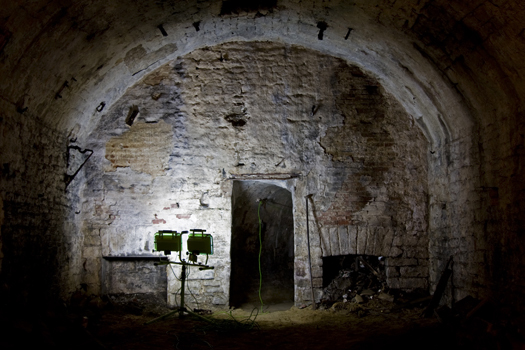 - The entrance to the lagering room. Note the wooden door. Jim explained that after the brewery had ceased its original use it had been used to manufacture porcelain toilets and sinks. 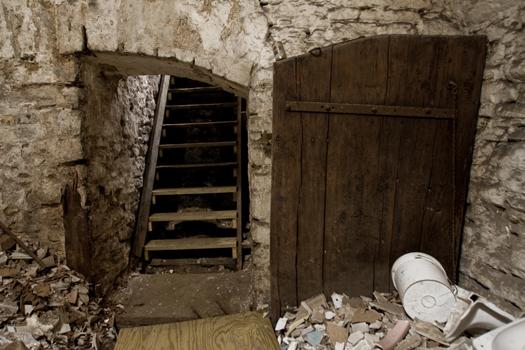 The defective products had been thrown down into the cellar from the upper floors leaving the lagering room floor filled with crushed porcelain. Jim, Steve, Brad and other volunteers had put in many hours to clear out a path through the debris. - Debris in the Lagering Room. Note the crushed porcelain toilets. 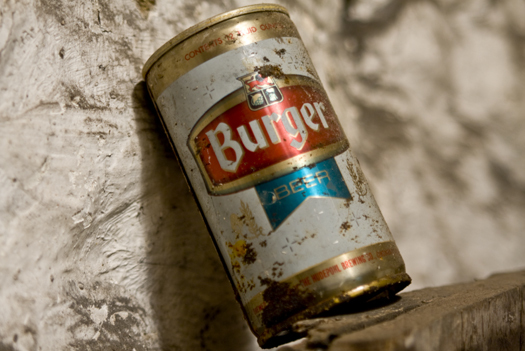 - An old Burger Beer can found amongst the rubble. Burger is one of many local brands that is making a resurgence today. More lights are coming and more work needs to be done before the tour, but Steve and his crew have worked hard to clear out much of the debris that had filled the brewery's lower rooms. 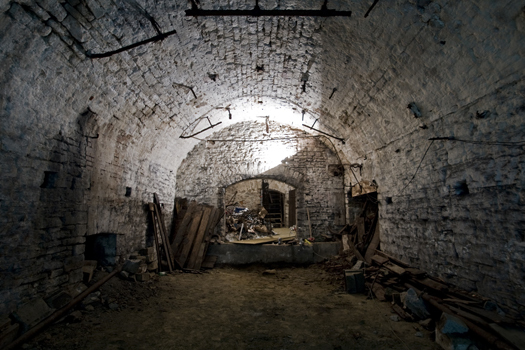 - The former Crown Brewery on McMicken Ave.
As I entered into the main portion of the lagering room, it was like walking into an archaeological dig site, like something out of Indiana Jones. The coolest aspect of the buildings history though was at the other end of the room. - Entrance to the tunnel. 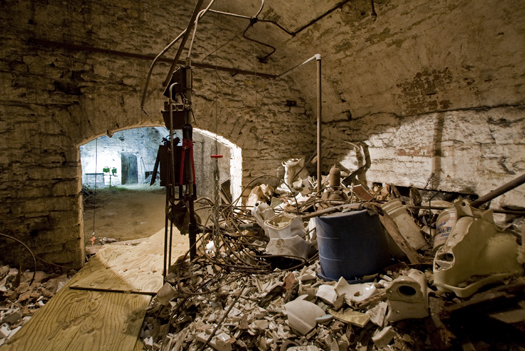 The lagering room features a tunnel that runs beneath McMicken Ave. to the Over-The-Rhine Boatworks across the street. 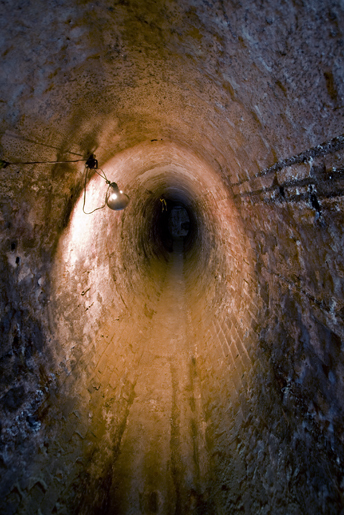 - The tunnel connecting both buildings beneath the city streets. 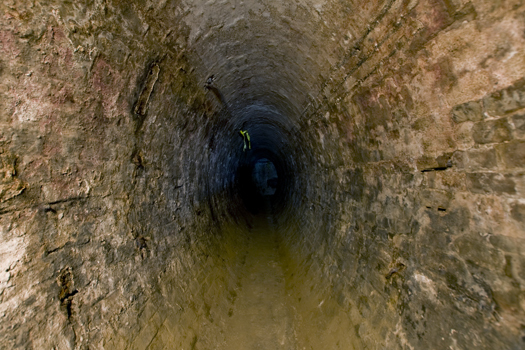 The tunnel dead ends into a dark room with a hole above it. The volunteer crew is planning to install stairs where the tour groups will exit back up to street level, across the street from where they started. - The other end of the tunnel. If it wasn't for the dedicated work of volunteers like Steve, Jim, Brad and the others, historical gems like this may have never been discoverd, left to be forgotten. You have the chance to see the Crown Brewery and four others for yourself by attending the Prohibition Resistance Tour. I highly recommend it, this is a great opportunity to see an incredibly unique piece of Cincinnati history. For information on the Prohibition Resistance Tour including availability, prices and times, check out the OTR Brewery District's Offical Website. Special thanks to Steve, Jim and Brad for allowing me to check this place out. Also check out our trip to Hudepohl Brewery, another abandoned brewery on the other side of the city. And for more information on Cincinnati's Brewing History, check out this blog and an upcoming book by my friend Sarah: Brewtiful Cincinnati. 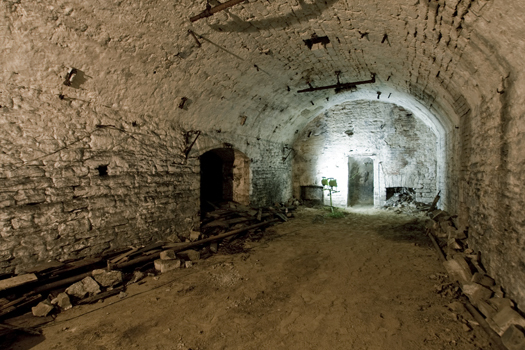 Tours of this former brewery and others are now readily available almost every weekend here. All this stone & wooden doors, it's truly like another world all it's own in this place, isn't it? Great photographs and amazed at the lighting & detail you continue to capture in these old places(Love the can of Burger beer) and I look forward to seeing more of your work.